The Utter Command menu gives you access to the Utter Command documentation, on-screen guides, dialog boxes and utilities. When Utter Command is loaded the Utter Command icon appears in your System Tray. 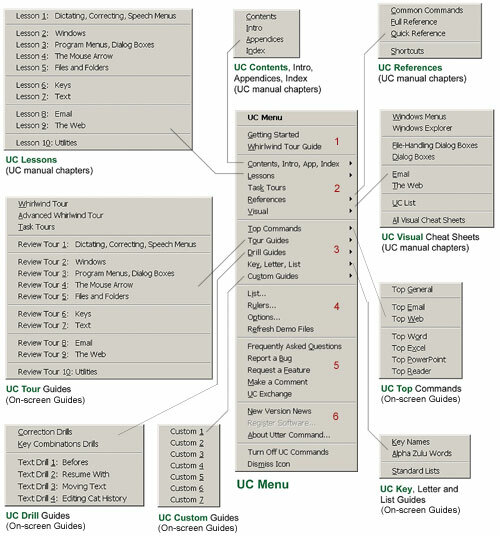 Contents, Intro, Appendices, Index; Contents shows you what to say to get to any section or subsection of the UC manual. References include a Full Reference of every command with brief explanantions, Quick Reference of all commands, and Common Commands cheat sheet. Visual Cheat Sheets illustrate key Windows, Windows Explorer, dialog box, email, Web, and UC List commands. Drill Guides show the Self-guided Drills from Lessons 1, 6 and 7. Key, Letter and List Guides show speech names for keyboard keys, letters, and the UC List presets. UC List allows you to organize your own File, Folder, Web Site, email Nickname, Keyword and Reminder word lists so you can use a single command to get to any file, folder or Web site, set up an email message, find any keyword in any document, and set a reminder with any message (see UC UC List Visual Cheat Sheet and UC Lessons 5.6, 5.7, 8.4, 9.2, 10.1 and 10.13). UC Rulers puts rulers around your screen that help you more precisely control the mouse by speech. When the rulers are active you can say "Rulers Menu" to open a menu that allows you to control what the rulers look like (see UC Lesson 2.5). Sections 5 and 6 items bring up pages from the Utter Command Web site and the About dialog box.